Downlighting may be an option you’ve never considered, possibly because you don’t know what it is when it comes to outdoor lighting. This time of year, if you want to get the most out of your outdoor living spaces, they have to have good lighting because the sun sets so early. Downlighting may be an option you’ve never considered, possibly because you don’t know what it is. Downlighting is actually exactly what it sounds like: when a lighting fixture is mounted up high and aimed downwards to illuminate whatever is below it. 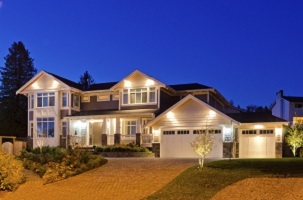 There are many elements of your yard and landscaping that can be improved with some downlighting. Ponds are a great place for downlighting since it highlights key features without destroying the tranquil atmosphere that the pond provides. Ponds also provide a reflection on the water’s surface, which is played up nicely by down lighting, especially when the surface is moving and rippling. Patios are another great place for outdoor lighting since they are usually areas where you need to be able to see where you’re going but you would also like to be able to set a low-key tone with lighting. Downlighting can be installed on handrails, banisters, and below tables. This way they light the areas where people need to walk without being overwhelming to the people relaxing on the patio. Paths are another area of your yard that needs to be well lit for safety. You don’t want people stepping off the path and hurting themselves in the dark. Once upon a time, your only option might have been to illuminate the whole area with floodlights. Downlighting, via lights mounted on poles along the path or even on trees overhead, is a great alternative for outdoor lighting They provide enough light to safely see where you’re walking without washing out your whole landscape. If you have statues or other large features in your landscaping, consider down lighting them. Often the default is to illuminate these items from below with lights aimed upwards, but often this creates unnatural shadows. Statues are designed to be lit from above (by the sun) and down lighting mimics that effect. Trust Lehnhoff’s Supply and Design for All Your Firewood Needs! This entry was posted on Friday, December 7th, 2018 at 10:13 am. Both comments and pings are currently closed.